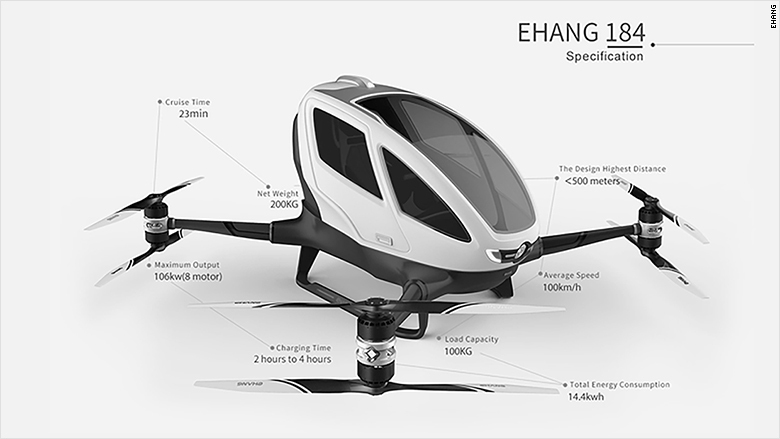 Huazhi Hu, founder and CEO of EHang, called the agreement a "big step" for the Chinese company. "[The partnership] will lay the foundation for its commercialization and building up the aerial transportation ecosystem in the future," Hu said in a statement. 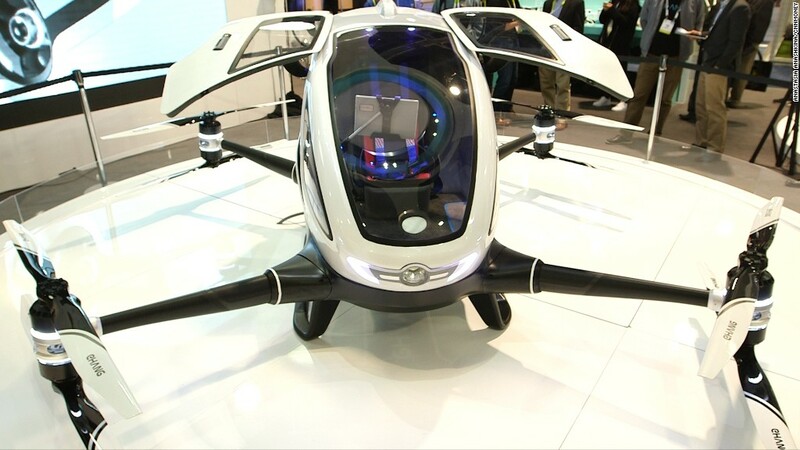 The EHang 184 is a jumbo drone that carries one passenger. There is no pilot -- either on the ground or in the machine. Fliers sit in the drone, tell the drone's navigation system where they want to go, and it controls the flight path. In the future, if these machines get approved to fly, EHang's central software system will pre-plot and coordinate all drone flights to avoid potential overlapping paths. Drones are currently largely banned from flying over people not associated with the aircraft. But the FAA is looking at loosening regulations to clear the way for commercial uses of drones, like for delivery and aerial photography. Drones would have to fly 20 feet above people's heads, and have a 10-foot buffer space on all sides, mostly for safety during take off and landing. The rules are meant to minimize any potential injury to people on the ground should a drone malfunction or an operator lose control. They would apply to drones that weigh more than half a pound and less than 55 pounds, though more powerful drones would be subject to additional rules. Drones like the The EHang 184 will likely need its own set of rules, given that it weighs 440 pounds and can go up to 62 miles an hour. The Nevada Governor's Office of Economic Development called the partnership with EHang "historic." "I personally look forward to the day when drone taxis are part of Nevada's transportation system," said Tom Wilczek, GOED's Aerospace and Defense Industry Specialist.